What do you call a sleepy village in Assam, where the entire population weaves magic with silk? “Silk-haven”, “Manchester of the East”, “Manchester of Assam”. Yes, these are a few synonyms given to Sualkuchi (pronounced Hualkusi) because of its large number of textile industries. Situated some 30 km from Guwahati in Assam, on the bank of the mighty river Brahmaputra, this picturesque village is a haven for silk fabrics ranging from the golden Muga to the ivory white ‘Pat’ and the light beige ‘Eri’ or ‘Endi’ silks. Out of which, Muga & Eri, also known as Ahimsa Silk are native only to Assam. 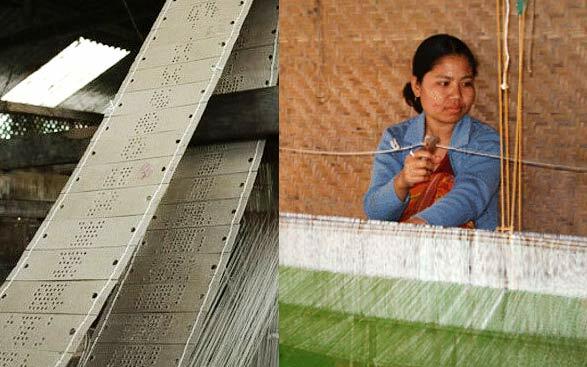 Sualkuchi as a silk weaving village was established in the 17th century by Momai Tamuli Barbarua, a great administrator of the Ahom Kingdom during the reign of King Swargadeo Pratap Singha (1603-1641). 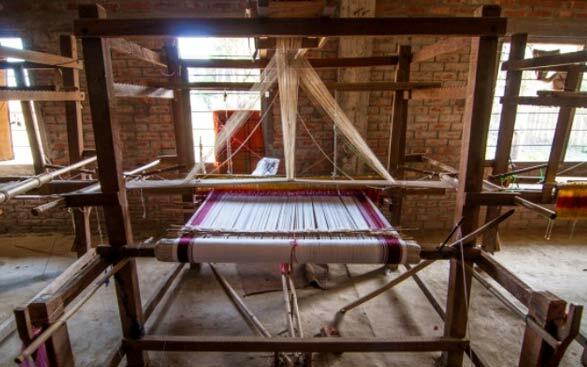 However, silk weaving in Sualkuchi actually has been traced back to around 10th-11th centuries when King Dharma Pal of the Pala dynasty sponsored the craft by bringing the Tanti weaving community from Tantikuchi to Sualkuchi. The village even finds mention in Kautilya’s Arthashastra by the name of Suvarnakudya of ancient Kamrupa, where the best quality of Patrorna (Pat) was produced around the 4th century BC. Suvarnakudya was probably known later as Swarnakuchi, which probably became Sualkuchi in the end. The village took shape as a weaving village when the Ahoms occupied Sualkuchi by defeating the Mughals in the mid-17th century. 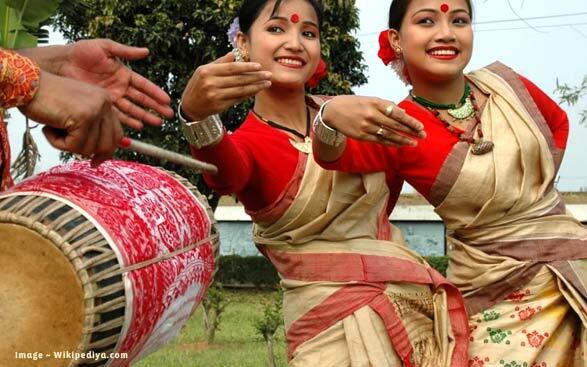 Patronized by the Pala and the Ahom kings, the craft established itself and during that period, it was a luxury afforded only by the royalty and the noble families of Assam. Originally, Sualkuchi was a ‘craft village, home to several cottage industries like handloom weaving, oil processing, pottery, gold making etc. But all of these, other than weaving have almost become extinct. The weaving industry of Sualkuchi remained confined to the Tanti community till the 1930s. Later on, people from other communities also took up silk weaving. Even some fishermen and Brahmin communities took to weaving as their main source of income as handloom was emerging as the most profitable source of income. The weaving industry of Sualkuchi received a major boost during the 2nd World War. Slowly, almost the entire village took up weaving. Weaving comes naturally to the natives of this village. It is ingrained in their lifestyle. Expert weavers from other districts also throng this place for its commercial prominence. Infact, the migrant weavers who work on wages are dominating the locals at present. The women weavers outnumber the male weavers. 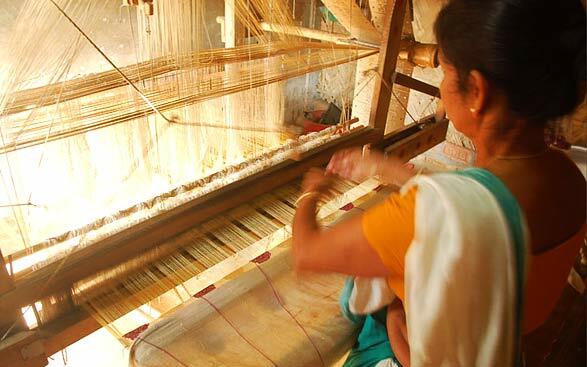 Though cotton and khadi textiles are also woven but silk weaving is more prominent and well known. As one walks the numerous tiny streets of Sualkuchi, one can hear the rhythmic sounds made by the looms and the flying shuttles. It is spellbinding to see these women & men at work. The rhythmic movements of hands & legs on looms turn silk threads into magnificent fabrics, with the help of punched cards surfacing gorgeous woven motifs. These premeditated motifs are first drawn on graph papers. Then holes are punched on rectangular cardboards along the lines of the design to make the punched cards. The woven motifs are mostly inspired from the flora & fauna found in the state, ranging from various flowers to peacocks, deer & rhinos etc. Another common motif is of the ‘Jaapi’ or the traditional Assamese hat. Weaving one saree takes about 6 days and sometimes more depending on the design. 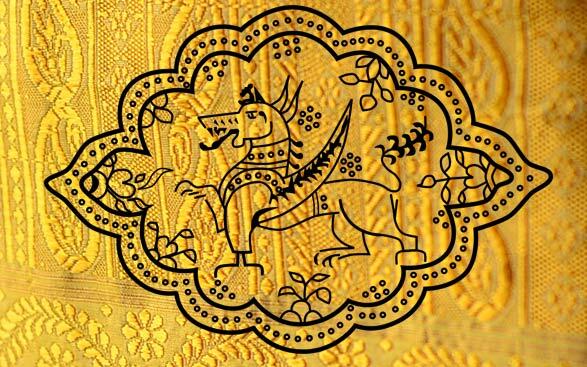 During the period of the royalties, only golden zari was used for the woven motifs but late as weaving became more commercialized, silk & even cotton threads for the motifs were used. 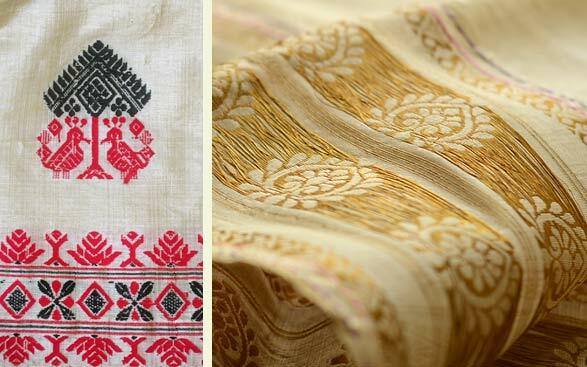 Out of the three types of silks indigenous to Assam, the Muga silk is naturally golden in color and is known for its durability, often outliving its owner. This silk is produced by the silkworm Antheraea assamensis. It is known to become glossier with each wash. The Pat silk is ivory white in color and is produced from the Bombyx textor silkworm. The light beige Endi or Eri silk is produced from the Samia cynthia ricini and is also known as the ‘Ahimsa silk’ as its production allows the development of the pupae into adults and then only the open-ended cocoon is utilized for silk manufacturing. 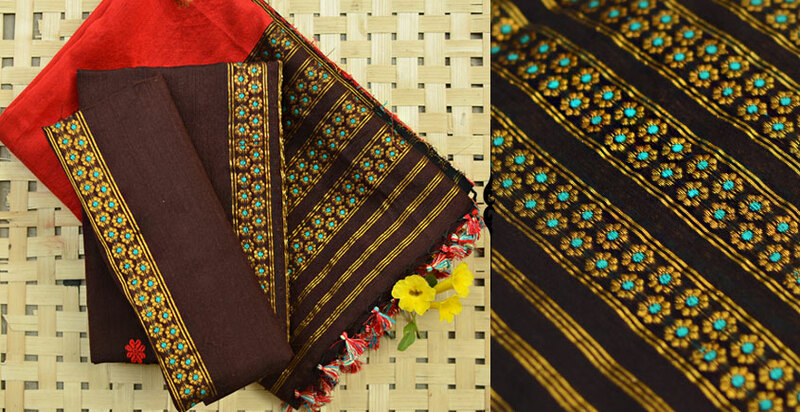 Eri is famous as shawls because of its natural warmth & softness. These silks can also be dyed into various colors if required. Made by Artisans working with Bibaar. About Sizes Free size saree and a matching blouse piece. What do you call a sleepy village in Assam, where the entire population weaves magic with silk? “..